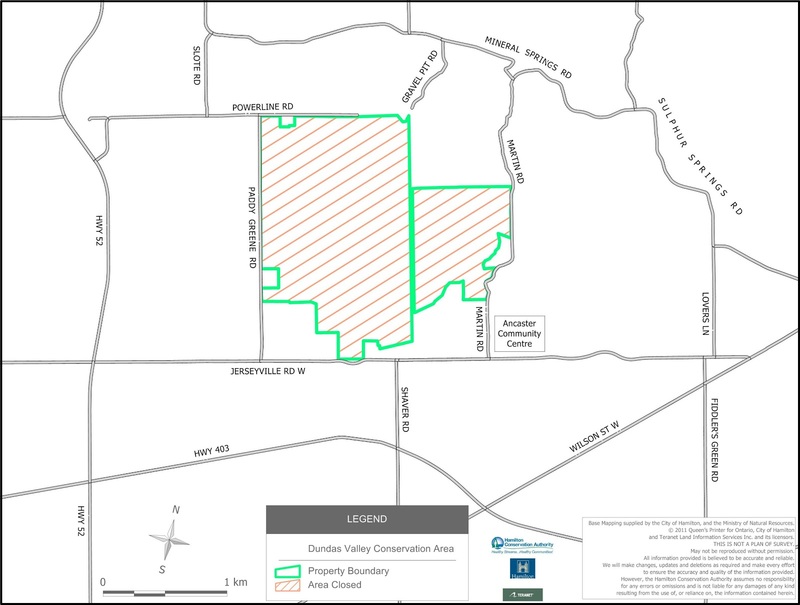 "The westernmost section of the Dundas Valley Conservation Area will be closed to the public on specific days to allow the Haudenosaunee to harvest deer according to the Protocol and Specific Agreement. For a full description and related documents concerning this closure, please click here. Harvesting will take place only on HCA owned lands within the area bounded by Martin Road to the east, Jerseyville Road to the south, Paddy Green Road to the west, and Powerline Road to the north. Harvesting will take place Mondays, Tuesdays, Wednesdays, and Thursdays between November 13 and December 20, 2012 and January 7 – January 17, 2013 inclusive. For a map of the closed area, click here." For trail users, this takes in the majority of the westernmost Headwaters trail of the Dundas Valley trail system. The Hamilton Spectator reports the hunt area will be off limits to the public until Jan. 17, Monday through Thursday, but remain open on weekends. The HCA has posted signs on affected trails and notified local residents of the closure. The agreement allows the hunt to take place four days a week and allows Six Nations hunters to kill 80 deer which is twice as many as the previous year. The Haudenosaunee have hunting and fishing rights under a treaty with the British Crown.